Those who study and classify prehistoric cultures use the term "type site" to mean a site that is a model for others. Those that are similar in terms of human remains, tools and other cultural artifacts are then classified as part of a particular culture and are named for the type site. Thus, we may find a site somewhere in eastern Europe and say that it is "Neanderthal" (modern spelling "Neandertal") because it is similar to the type site in the Neander Valley in Germany (near Düsseldorf) where the first discoveries were made (1856) that led to a description of that widespread and long-lasting prehistoric at least 100,000 to 35,000 yearsago). Scientific opinion concurs generally that approximately 40,0000-45,000 years ago, modern humans appeared in Europe and for a period possibly as long as 5-to-10,000 years) co-existed with the Neanderthals. After this co-existence, the Neanderthals disappeared. (It isn't clear exactly why. Possibly they were absorbed into the modern human line,* or they may just have disappeared because they couldn't adapt to changing environmental conditions. It is not likely that they were "driven to extinction" in some last great epic Battle of the Cave Men, although there have been bad movies about that.) These first modern humans in Europe, then, are referred to as members of the Aurignacian culture, a name originating from the type site (discovered in 1860) of Aurignac, France (60 km SW of Toulouse). The period of the Aurignacians lasted broadly from 45,000 to 35,000 yearsago. Aurignacian remains are identifiably different from those of the Neanderthals, and the period produced, besides improvements in tools, the rock art found in caves in France, Spain, and Italy. While central Europe has an abundance of evidence of the activities of our early modern ancestors, the Aurignacians, opinion until very recently has been that sites in southern Italy as old as 40,000 years ago represented earlier Neanderthal populations and that Aurignacians did not penetrate until 30,000-35,000 years ago into southern Italy. Classifying a succession of prehistoric cultures is complex since many sites—the Famane cave near Verona, Italy, for example—have many layers representing a chain that might stretch over thousands of years. In southern Italy, in addition to the traditional terms of Neanderthal and Aurignacian there is now also the term Uluzzian, also from a place name, Uluzzo Bay, on the Ionian Sea, i.e., the west side of the "heel" of the Italian boot, north of the town of Gallipoli. The type site was first explored in 1961 by Arturo Palma di Cesnola of the University of Siena and Edoardo Borzatti von Lowenstern of the University of Florence. The term "Uluzzian" was coined by the former, apparently based on his conclusion that there were sufficient differences from Neanderthal sites to warrant classification as a different type. The site type is in a coastal area that contains more than a dozen other caves with evidence of prehistoric human presence. The original Uluzzian site was considered Neanderthal in most sources—that is, not as developed as Aurugnacian sites in the north. That situation has changed recently and dramatically with a report in the science journal Nature by Stefano Benazzi, a physical anthropologist at the University of Vienna. Teeth and a jaw fragment discovered in the Grotta del Cavallo on the bay of Uluzzo (#1 on map, below) in 1964 and first identified as Neanderthal remains were reexamined by Benazzi (2011) using digital models from CT scans to compare the teeth to other Neanderthal remains. His team found that the Italian teeth are more closely related to modern humans. Thus the Grotta del Cavallo site is likely to be Aurignacian; the evidence now seems to indicate that modern humans lived in southern Italy 45,000 years ago, 5,000 years earlier than previously believed. Benazzi writes that "...the Cavallo human remains are therefore the oldest known European anatomically modern humans, confirming a rapid dispersal of modern humans across the continent before the Aurignacian and the disappearance of Neanderthals." Note that the expression "before the Aurignacian" relegates "Aurignacian" to a position of lesser importance in attempts to straighten out the chronology of early humans in Europe—or at least upgrades "Uluzzian" to mean something like "southern Aurignacian." Both terms mean "modern human." I call your attention to the Paleolithic Park of Notachirico, (from its own self-description), "one of the best preserved and richest in material European sites about the Middle Pleistocene." (The Middle Pleistocene is colloquially called the Ice Age, the geological epoch that lasted from about 2,588,000 to 11,700 years ago, spanning the world's most recent period of repeated glaciations). The Park of Notachirico displays early human and animal remains from the Lower Paleotihic (the earliest subdivision of the Old Stone Age). The park is in the Basilicata region of Italy (formerly Lucania), in the city of Venosa, about 30 km north of the city of Potenza. 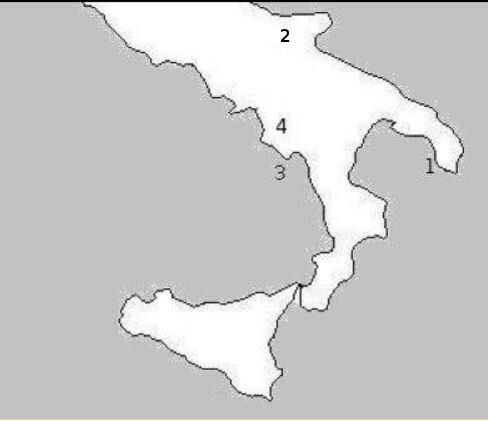 All of this is roughly 130 km south-east of Naples (inland from number 4 on the map, below). Material is found either at the open-air site (the "digs", essentially an 11-layer excavation, image above) at the Paleolithic Park of Notachirico, a site a short distance away from Venosa or held in the national archaeological museum of Venosa. The site at Notarchirico may be visited only by appointment (tel. 0972 374791 - Cell. 339 1631053). The museum in Venosa maintains normal museum hours. The oldest material at the park dates to about 360,000 years ago. The importance of this Park depends on the fact that it is one of the best preserved and varied European sites about the Middle Pleistocene. This site was uncovered as a result of work by the Italian Institute for Human Paleontology in 1979. Several excavations were made from 1980 to 1985, directed by the Basilicata Archeology Board that brought to light extensive layers with manufactured artifacts associated with elephant, cow and deer remains. These artifacts are the first traces of human presence in Basilicata, including the finding of homo erectus from the late paleolithic. Examples of rock art are also present. Animal remains in nearby areas include those of elephants, rhinoceros and species now extinct such as the saber-toothed tiger. The report also invites us to reconsider other sites, such as la Grotte des Fées, in Châtelperron, France, the eponym of another paleolithic culture, the Châtelperronian, also somewhat unclearly astride the boundary between the Middle and Upper Stone Age. The change from a Neanderthal to an Aurignacian (modern human) population is, in fact, that boundary, but since the changeover lasted thousands of years, you (the Châtelperronians) could leave prehistoric prints on both sides and in the middle to confuse scientists in the distant future. Making sense of all this is complicated since other recent research (Riel-Salvatore) indicates that the lowly, long denigrated Neanderthals may have been smarter than we thought and more capable of adaptation. Neanderthals and modern humans co-existed for at least 5,000 years often in the same places(! ), distributing their artifacts through various layers likely to be mixed by natural forces over the centuries. To my non-expert mind that is confusing, but perhaps I am easily confused. There are a number of interesting prehistoric sites in southern Italy (map, right). Again, the question is not whether there is evidence of any prehistoric presence in southern Italy. Such evidence is abundant. (See Homo Erectus Aeserniensis about a site near Naples where there is evidence of ancestral human activity from 700,000 years ago!) Indeed, many of the sites on the map show ample evidence of Neanderthal presence. Nor is the question whether or not there was later modern human (Aurignacian) presence. There was, but most research at these sites shows that it started about 30,000 ago. That would fit the traditional opinion that modern humans were late-comers to the south. The question is whether the claim based on work done at Grotta del Cavallo will hold up and whether there is similar evidence just waiting to be found. If there is, then "Uluzzian" will have earned its promotion to type site. To me, the most interesting cave sites near Naples are near the town of Camerota (n. 3 on the map), about 130 km/80 miles south of Naples. The area near the tip of that flattened stretch of coast line that juts out into the Tyrrhenian Sea to separate the gulf of Salerno to the north and the gulf of Policastro to the south is about 50 km long and is part of the Cilento & Vallo di Diano National Park. At the southernmost tip of that stretch, you are within the boundaries of the town of Camerota. The coast displays a number of caves, both sea caves and surface grottoes. (Other names may be used, such as the Centola caves, but "Camerota caves" is most common.) Thirty-two caves have been counted so far, on the surface as well as submerged, excavated into these “Palinuro cliffs” (from the name of Aeneas' helmsman in Virgil's Aeneid). A few them are now tourist attractions with guided tours from a boat, setting out to explore such natural works of art as the Blue Grotto (pictured), the Silver Grotto, the Monks' Grotto, and the Grotto of Blood. The Blue Grotto, for example, is the best known and most visited. The intense plays of blue in the water are every bit as impressive as in the more famous sea cave of the same name on Capri. The flora and fauna in the Blue Grotto make it a miniature biological laboratory, and it has been the object of serious scientific interest since the 1980s. A few meters further on you find the Hall of Snow, a chamber where there are examples of other color variations and hydrodynamism in the form of thermal vents at the bottom; water loaded with sulfur mixes with the sea water and sulfur bacteria on the rocks in the grotto to produce a kind of underwater “snow storm” quite visible to scuba divers. The best known of the caves, as noted, bear descriptive names. Cala Fetente (Stinky Cave!) lets you know what to expect: the greatest manifestation along the coast of the smell of sulphydric acid (rotten eggs!). The whole cave is 300 meters long; you walk in for the first 20 meters and then there's a lake. Sulfur bacteria have built up visible colonies on many of the surfaces. And so forth. Many of the caves show signs of human habitation at some point in the distant past. Interestingly, one of them, called Cave of Bones (near Marina di Molpa), had so many human remains that researchers first thought they had stumbled upon much more recent evidence of, say, Roman ships wrecked along this coast as they returned from the Punic Wars. Not so. Research now shows them to be pre-historic. So far, I have not seen the claim that there is Aurignacian presence here as early as the one at Grotta del Cavallo, but the Camerota caves do show Neanderthal and later Aurignacian presence (30,000 years ago). -Bietti, Alicare. (1997). "The Transistion to Anatomically Modern Humans: The Case of Peninsular Italy" in Conceptual Issues in Modern Human Origins, chapter 9. Editors G.A. Clark & C.M. Willermet. Aldine De Gruyter, Inc. Hawthrine, New York. -Benazzi, Stefano et al. (2011) "Early dispersal of modern humans in Europe and implications for Neanderthal behaviour" in Nature 479, 525-528. -Callaway, Ewen. (2010) "Neanderthal genome reveals interbreeding with humans" in New Scientist, off-sitehere. -Mussi, M. Patrizia Gioia & F. Negrino. (2006). "Ten Small Sites: the Diversity of the Italian Aurugnacian" in Towards a Definition of the Aurignacian: Proceedings of the Symposium Held in Lisbon, Portugal, June 25-30, 2002. Instituto Portugues de Arqueologia. -Riel-Salvatore, Julien. (2010) "A Niche Construction Perspective on the Middle-Upper Paleolithic Transition in Italy" in Journal of Archaeological Method and Theory. Reported as "Neanderthals more advanced than previously thought" in Science Daily. -Stringer. C.B. (1992). "Evolution of Early Humans" in The Cambridge Encyclopedia of Human Evolution. Cambridge Uni. Press 1992. My thanks to Prof. Warren Johnson, who suggested this topic to me. ...we report the dating of annular constructions made of broken stalagmites found deep in Bruniquel Cave in southwest France. The regular geometry of the stalagmite circles, the arrangement of broken stalagmites and several traces of fire demonstrate the anthropogenic origin of these constructions. Uranium-series dating of stalagmite regrowths on the structures and on burnt bone, combined with the dating of stalagmite tips in the structures, give a reliable and replicated age of 176.5 thousand years (±2.1 thousand years), making these edifices among the oldest known well-dated constructions made by humans. Their presence at 336 metres from the entrance of the cave indicates that humans from this period had already mastered the underground environment, which can be considered a major step in human modernity. Readers should note that such discoveries contribute to the so-called "rehabilitation" of the Neanderthals. They have gone from low-or-no-brow cave men with no culture to quite something else: they made tools, used fire, created art, practiced religion, and, probably, had language. Stay tuned. This promises to be important.